Product #3025 | SKU SASZONE | 0.0 (no ratings yet) Thanks for your rating! The Samson S-Zone is a 4 zone stereo mixer designed for fixed installation in bars, restaurants, clubs, offices, schools and more. 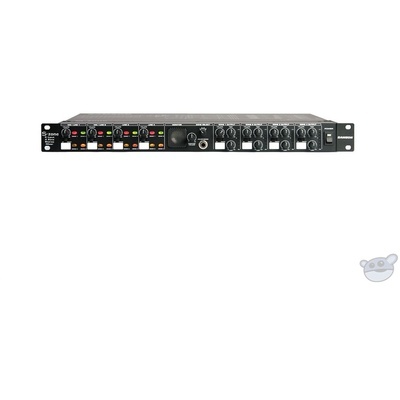 The mixer is designed with 4 inputs that are completely assignable to any of the 4 output zones. The result is an audio matrix, routing system that can isolate audio in specific areas within a venue. 2 balanced microphone and 4 balanced aux/line inputs are featured. A ducking feature provides a "talk over" effect while paging or announcing over music. The front panel features a volume control for each input and output zone, high and low tone controls are provided for each output zone. A built-in monitor speaker and headphone output are featured for monitoring any of the output zones. A convenient single rack-space enclosure make the S-Zone an ideal solution for fitness clubs, houses of worship, retail stores, lounges, etc. The Samson S-Zone features 4 inputs and 4 output zones. Input channels 1 through 4 are assignable to any of the output zones, isolating audio in separate areas. A built in speaker and headphone monitor output can be assigned to monitor any of the output zones. A ducker is assigned to the microphone inputs and provides a "talk over" effect when paging or making announcements over music or program material. The rear panel connectors are Euroblock style for a trust worthy, solid connection to and from signal sources.